I stumbled on this recipe from Marcie from Flavor of The Moments and had to create this. It resembles a blueberry french toast bake but is made with gluten-free oats and organic maple syrup and coconut oil making it so less calories than the french toast. AND I love that it's mostly prepared the night before making it an easy simple thing to do for your Christmas brunch. If you are like me, I will be cooking Christmas dinner all day long so the last thing I want to do is wake up having to worry about getting a huge brunch together. I want to sip espresso and see what Santa has brought everyone. If you’re not familiar with overnight oats, you simply toss old fashioned rolled oats with the milk of your choice, a bit of sweetener, and some cinnamon if you enjoy that, and leave it in the fridge overnight. The oats absorb the liquid and they’re ready to eat in the morning with fresh fruit, compotes, nuts, etc. So simple and so delish. 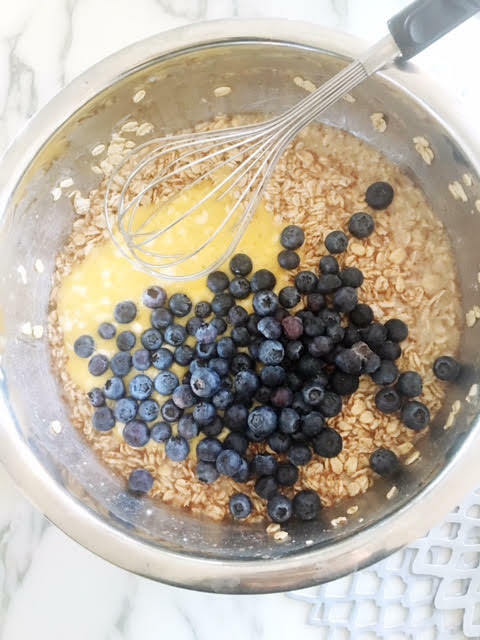 I have another overnight oat recipe on the blog if you want some great grab-and-go breakfast options for the hectic work week. So this is the perfect make ahead brunch item loves. The crumble can even be done the night before and stored in the fridge. All you have to remember is the crumble isn't added until halfway through the baking time until most of the liquid has been absorbed, because you would hate for it to sink. You want it to be nice, golden brown, and crispy! My mouth is watering just thinking of this! Place the oats, milk, sweetener, and cinnamon in a medium to large bowl and stir. Cover with plastic wrap and refrigerate over night. Do not add the egg or baking powder. The next morning, preheat the oven to 350 degrees and grease an 8x8" square baking dish. Set aside. Whisk the beaten egg and baking powder into the oatmeal mixture until there are no lumps. Stir in the berries. Pour the mixture into the prepared baking dish and bake for 20 minutes or until the majority of the liquid is absorbed. While the oatmeal bakes, prepare the crumble. 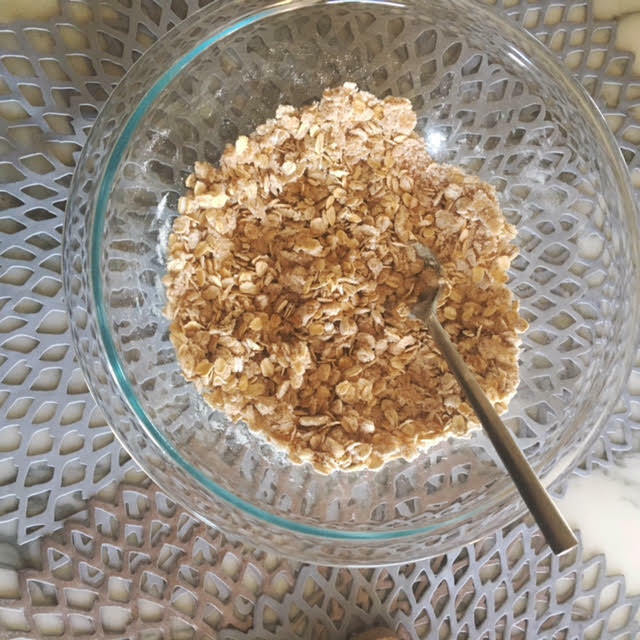 Stir the oats, flour, and sugar, and pinch of salt together in a medium bowl. Stir in the melted coconut oil and let stand until the oatmeal has absorbed most of the liquid. Top the oatmeal evenly with the crumble and continue to bake for 20-30 minutes, or until puffed, bubbly, and golden brown. If the oatmeal is puffed and bubbly but the crumble hasn't browned, place it on the middle rack under the broiler for a few minutes until golden. Remove from heat and let stand 10-15 minutes. Serve and enjoy!